It’s not uncommon for dads to feel slightly left out when it comes to comforting baby. While this is true when it comes to carrying the baby for nine months, breastfeeding and taking leave from work, that doesn’t mean that dad can’t be involved. Despite having a bit of a notorious reputation, baby carriers specially designed for the man of the house are back. Let’s be honest, carrying your baby around all day in your arms is going to restrict your freedom and tire you out. Wearing a carrier doesn’t make dad any less of a man. 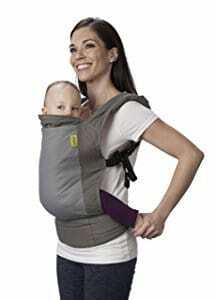 All the carriers listed below are ideal for carrying your baby around. Whether you’re going to the shops, out and about town or simply doing your daily jobs around the house, this new way to nurture your parental relationship is worth looking into. Imagine the softest, most gentle and supportive hug you could ever give your child. This is exactly what it’s like to use the AIEBAO Baby Carrier. This multifunctional carrier is designed to be as flexible, agile and durable as possible, giving you everything you need in one convenient package. 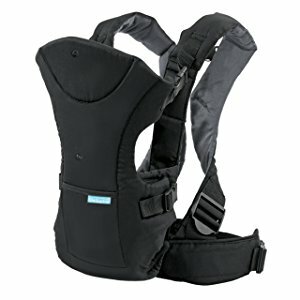 You can adjust this carrier to match whatever position is comfortable for you when carrying your baby; in fact, there are six unique settings to choose from. This means that you can carry your baby on your front, on your back, up high or down low, truly whatever is best for you. To make things even easier, this carrier comes with a huge collection of well-placed zip pockets and storage spaces. These give you instant access to all of your baby’s accessories, such as towels and snacks, without having to cause a fuss. This strap-carrier is machine washable and tumble drier safe, making it easy for dad to get involved with the washing. What's Great About It: To make sure that your baby doesn’t overheat, or get too cold during the winter months, the entire carrier is made to be temperature controlled. This is all thanks to the unique air panel, allowing air to flow freely around your baby while they’re in the carrier. This carrier is designed for absolute comfort. 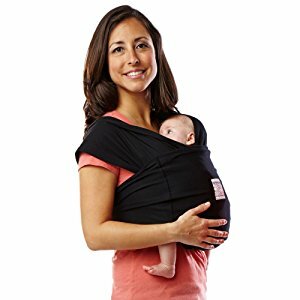 This popular charcoal black carrier is gender neutral for both parents to share the responsibility, but dark enough for dad to retain his masculinity. This carrier comes with three unique and adjustable settings. You can position baby to face dad, creating a cuddle-like environment, perfect for sleepy time. Alternatively, your baby can face outwards, allowing them to explore the world rushing past them in awe. Or simply pop baby on your back for an effortless journey, no matter where you’re going. The Infantino Carrier comes with fully adjustable lumbar support for added comfort on dad’s shoulders, and all of the straps contain extra padding for coziness all day long. The main body of the carrier is even made from patented BreathMesh materials. This helps to maintain a constant temperature in the carrier, whether it’s raining or shining. What's Great About It: To help protect dad’s best shirts, you’ll also receive a much-needed Wonder cover bib. This helps to catch any drool or sick, making carrying your baby a much more pleasurable experience. If dad is looking to recreate the traditional nurturing position, similar to the feeling of being in the womb, the Baby K’tan Carrier is an ideal choice. This carrier helps to soothe your little bundle when they’re distressed while helping to encourage a closer father-baby relationship. This carrier is extremely comfortable thanks to its soft materials, creating an inviting cuddle-zone for your baby to relax in while you’re out and about. Making things even easier for dad, there are no fiddly straps to play around with. If you want to adjust to any one of the six positions, you can do so easily by simply moving the carrier around. This award-winning carrier is suitable for both mom and dad. It’s washing machine friendly and comes in six vibrant colors that you’re both going to love. What's Great About It: Some of you may be thinking ‘If there are no straps, how can you guarantee a perfect fit?’ Well, in addition to having multiple sizes to choose from, the carrier is made from 100% stretchy cotton. This means dad and baby will always be as snug as a bug in a rug. This is easily one of the most popular baby carriers among dads. This carrier comes in 12 unique colors, allowing you to choose one that’s both gender neutral and a carrier that you’ll both be happy to use. What I love about this carrier is the removable insert that comes with it. This insert can be positioned in two ways, guaranteeing that you’re giving your baby the right amount of neck and back support. There’s a built-in hood that you can pop over your baby’s head while they’re asleep, keeping them from being disturbed. There are also some cute little foot straps to help keep your baby contented and supported. The 4G Carrier can be used on both dad’s front and back, making it easy for you to find whatever position is the most comfortable. The versatile design means this carrier can be used through infancy all the way through to the toddler stage, meaning you’ll only ever need this carrier. What's Great About It: You’ll also be safe in the knowledge that your baby’s well-being is in safe hands. This is because the Boba Carrier is made from 100% cotton materials and is completely free from harmful dyes, chemicals or production substances. If you’re looking for supportive, comfortable and easy to use baby carrier for dad, then you won’t need to look any further. This is one of my favorite carriers, and my husband couldn’t wait to wear it out. 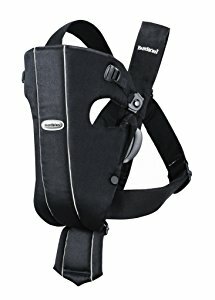 BABYBJORN has focused on trying to design a well-balanced, ergonomic carrier that maximizes comfort at the same time. I think it’s safe to say they excelled. This front-mounted carrier has two positions to choose from, both as cozy as each other while there’s no need to fiddle about with straps. Thanks to its unique design, dad can also enjoy a much more intimate bond with his child thanks to the closeness that this carrier provides. What’s more, this carrier is perfectly suitable for newborn children, so there are no hassles trying to fit in an insert. There are a lot of straps and clips with this one so it may be worth practicing a few times without your baby, but once you’ve got the hang of it, it's plain sailing. In truth, the presence of these straps only adds to already outstanding level of support and comfort that this carrier provides. What's Great About It: To help maintain the quality and cleanliness of this carrier, the entire thing is machine washable and dryer safe, making it a breeze for dad to clean his favorite baby accessory. Regardless of what carrier your heart is set on, there are a few basic features that you should be on the lookout for to ensure that your chosen carrier is the right one for you. First and foremost, you’ll want to look for a carrier that has multiple positions. These positions should allow you to secure your carrier to the front and the back of dad. You’ll want to be able to change position so dad can remain comfortable while using the carrier. Sometimes, it may get too tiring constantly carrying your baby on the front. With an easy to adjust carrier, moving baby to your back will be a breeze. You’ll also want to consider the safety aspects of your carrier. Always check to make sure that the straps are securely fastened and have a good grip. Although suitable, avoid Velcro where possible because the straps can catch on things and pull open. With dad’s safety in mind, look for a carrier that supports his natural posture and allows him to walk normally. As you can see from the pictures, most carriers have a lot that go into them. There are a lot of straps and bits of fabric, and this makes properly cleaning the carrier somewhat difficult. To minimize these stresses, simply buy a carrier that can be thrown into the washing machine, so it’s ready in no time at all. For this feature, look for nylon and cotton carriers. Let’s make things fair again and give dad the chance to get involved in carrying your baby. Not only will he be helping mom to have a well-deserved break from carrying the baby all time, but it will also help dad enhance his relationship with his child.